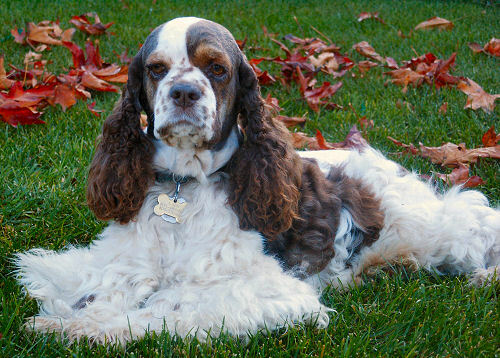 Cockers are one of the most beautiful breeds of dogs. Their long coats can be absolutely spectacular looking. 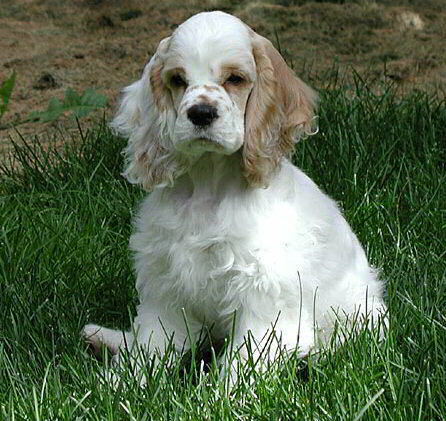 All breeds of puppies are cute, but Cockers remain cute all of their lives. 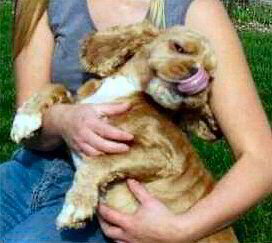 A well-groomed Cocker will definitely turn heads. 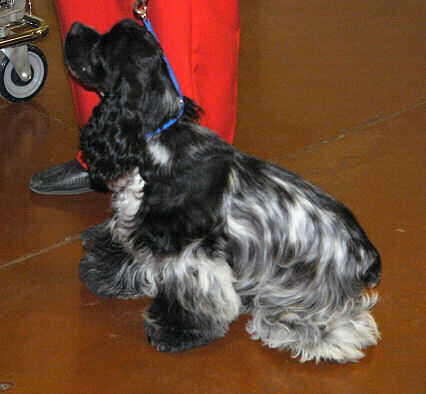 Cockers love people and are very devoted pets. It's a very people-oriented breed. 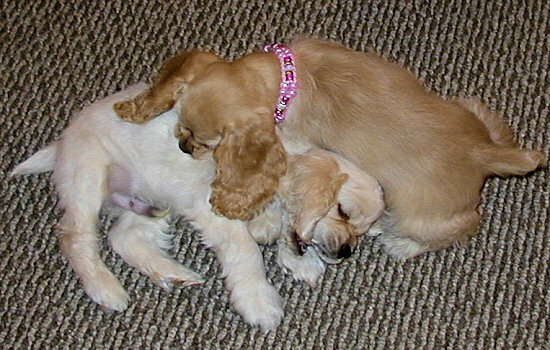 Almost all Cockers love to be with people, and are usually happiest if they are right by the side of their owner. It's a very happy breed. You'll often hear Cockers referred to as "merry". They just seem to be enjoying themselves most of the time. All you have to do is watch that tail wag, and you can tell when a Cocker is happy... which is most of the time. 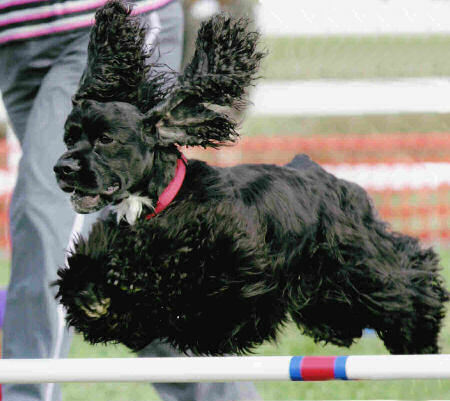 Most Cockers are playful and fun to be around. They'll often make you laugh. Imagine a dolphin, with fur and legs. A playful, happy, merry tail-wagger... that's the Cocker Spaniel. 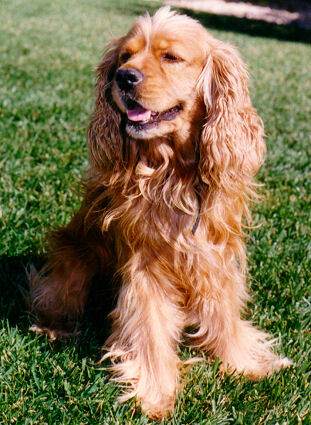 Cockers are physically smaller than many of today's most popular breeds, such as Labrador Retrievers, Golden Retrievers, and German Shepherds. This means you spend less on food, clean up less poop, can keep the dog in smaller areas, have an easier time physically controlling and transporting the dog, and that the dog will require less exercise. It's not that difficult to find a Cocker available near you. 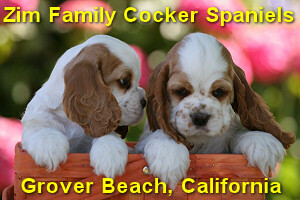 There are breeders in most of the 50 United States, as well as around the world. Adult Cockers in rescue shelters are widely available, too, and technology has made it easy to find them. As long as you keep an open mind about what coat colors you will accept, you shouldn't have too much problem finding a Cocker available within driving distance. 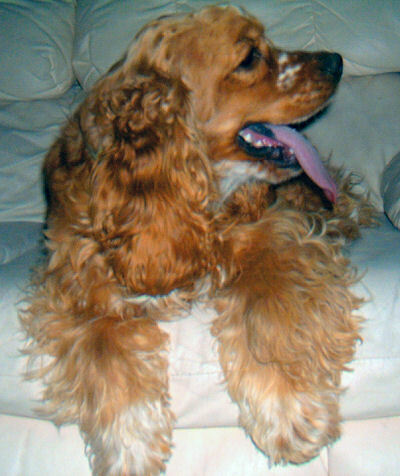 But if you get yourself locked in to thinking that you only want one of the more unusual Cocker coat colors, you'll have a hard time finding one! The hair grows like crazy! If you don't give monthly haircuts to your Cocker, or pay someone else to do it, you no longer have a beautiful dog... you have a furry mess. The picture on the right is a Cocker that was totally neglected by his owner. He ended up with a Cocker rescue group. You only have to forget to groom your Cocker for about six months before he ends up looking like this. 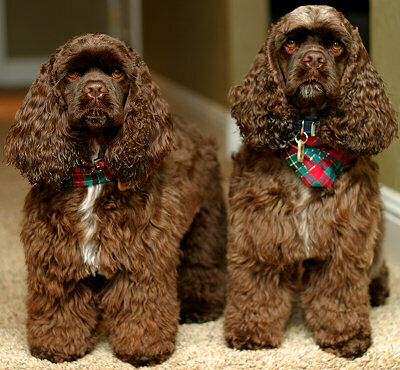 There are plenty of short-haired dog breeds out there. If you're not up to the challenge of keeping your dog's coat trimmed and looking good at all times, get one of those breeds instead of a Cocker! 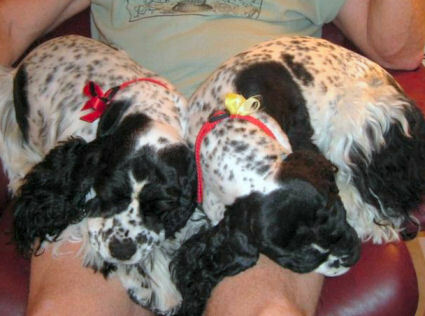 If you're allergic to dog hair... this is not the breed for you! 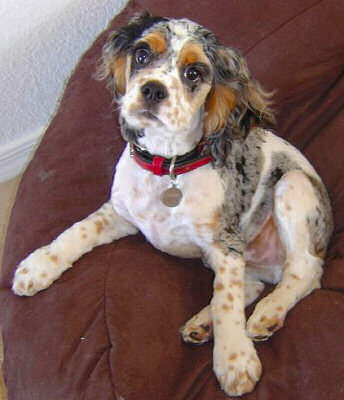 If you can't afford to pay a professional to give your Cocker a hair cut once a month, you'll need to fork over some money to buy your own electric hair clippers. While you can find budget-priced electric dog hair clippers at WalMart, you're far better off getting professional-quality equipment. It does a better job, and lasts a lot longer. The budget-priced stuff comes with a blade that can not be replaced. Unfortunately, the blade is the first thing to wear out! 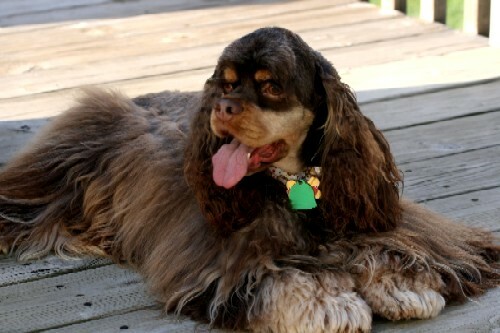 Take a look towards the bottom of my Cocker grooming page, and see what equipment I recommend for doing your own grooming. Factor these costs in to your decision to get a Cocker. 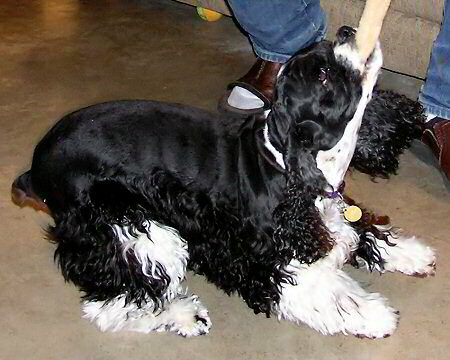 Besides monthly hair cuts, it takes a lot of brushing to keep a Cocker's coat from getting tangled and matted. 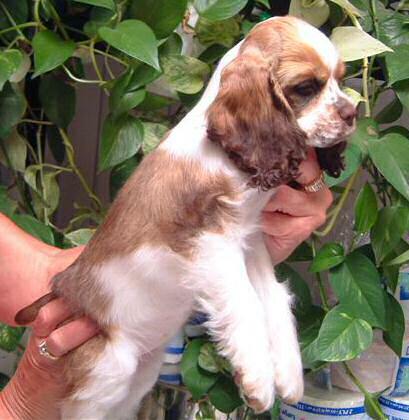 There are days when all Cocker owners find themselves thinking that owning a Beagle would be a heck of a lot easier! 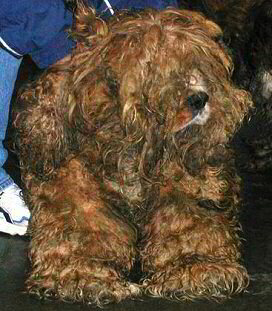 A neglected Cocker Spaniel that was turned over to a rescue organization. Because they are so people-oriented, Cockers don't handle being alone very well. 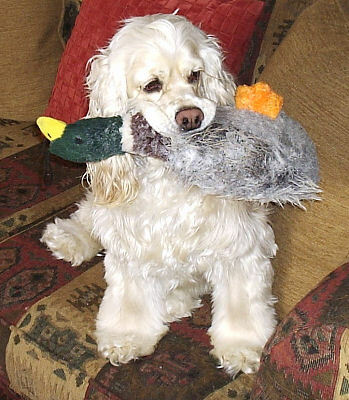 If you're like most people and you have to go to work or school all day, you'll have a lot of behavior problems if you just leave your Cocker alone all day. 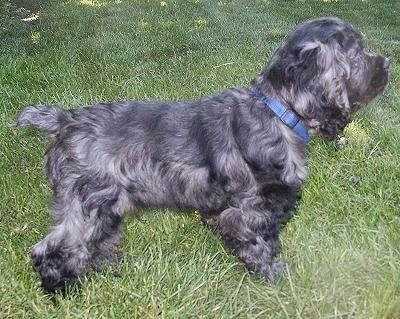 They may bark, chew everything in sight, dig in your garden, or pee & poop destructively. When you finally get home, a crazed monster is waiting for you. 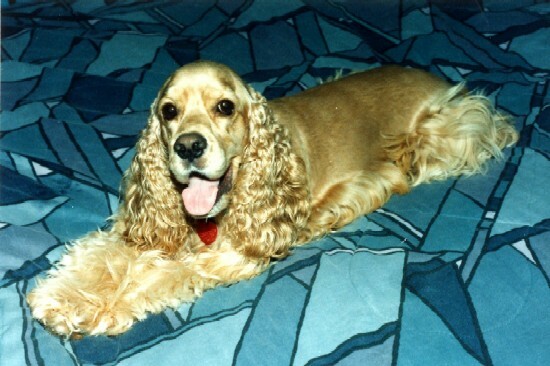 If you've heard that Cockers have a reputation for being hyper or a little crazy, it's because of all the people that have thought they could just leave a Cocker alone until they got home. Get a cat instead, and wait until you retire before you get that Cocker! Stay-at-home moms, people who work from home, retired people, and people who can take their dogs to work... these people will have great experiences with Cockers. 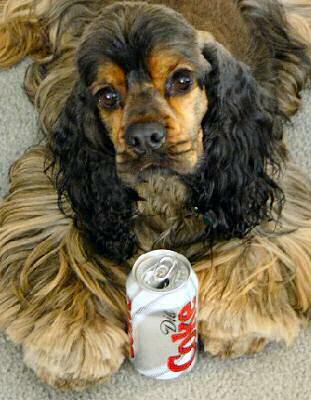 People who leave the dog alone all day will not have a good Cocker experience, and will NEVER get another Cocker again! If you're away from home all day and still insist on owning a Cocker... your best bet is to allow the dog to stay with a neighbor, friend, or relative when you're gone. 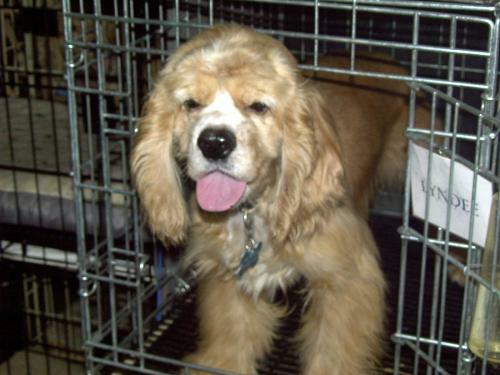 This is the same Cocker pictured above, after getting his matted coat shaved off. Cherry eyes (prolapsed gland of the third eyelid). Primarily a cosmetic issue, if you treat it quickly. Can cost several hundred dollars for surgery. Conjunctivitis (eye infections). Very common in Cockers. 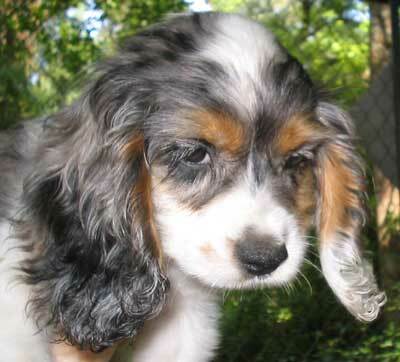 Not as serious or expensive as some of the other Cocker eye problems, but your vet will make a fair amount off of this, too. Distichia (misplaced hair along the edge of the eye, which grow towards the eye and irritate it). Severe cases can require surgery, which can cost several hundred dollars. Ear infections. 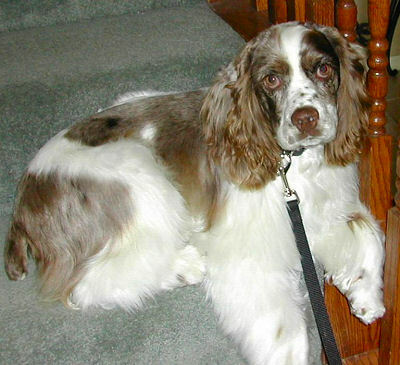 If you never do the preventive maintenance required, your Cocker could get such serious ear infections that his hearing could be threatened. Left untreated, ear infections can get out of hand and surgery can be required. However, if you're willing to do the work to keep the hair trimmed around the ear canal area, and if you use a good ear cleaner on a weekly basis, you can totally prevent ear infections. Skin problems such as Seborrheic dermatitis. Oily skin, flaky skin, stinky skin. Difficult problems to treat. Skin problems can also arise from food allergies, environmental allergies, and from flea infestations. Excited urination or submissive urination. 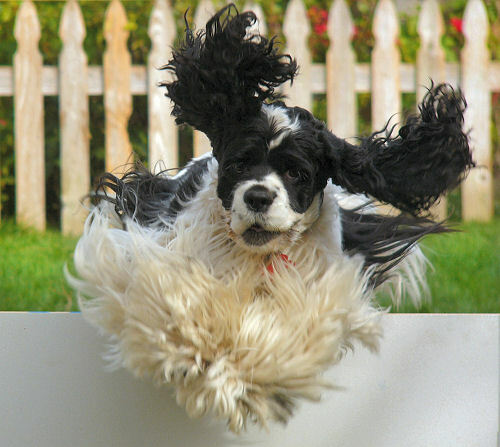 Compared to other breeds, Cockers are more likely to lose bladder control when happy or frightened. Of course, most Cockers do not do this, but some do... and it can be a VERY frustrating problem to live with. Autoimmune diseases. 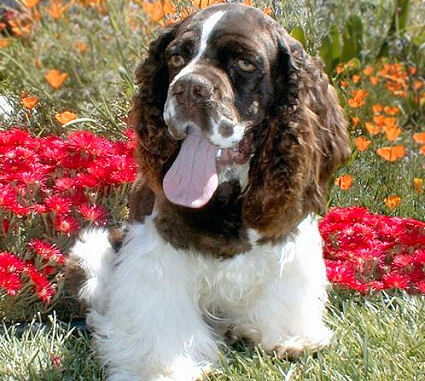 Cockers seem to be more prone to autoimmune diseases then most other dog breeds. This is extremely serious stuff... often fatal within a matter of days. 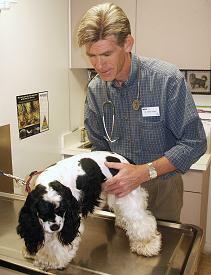 Get more information here, and be extremely skeptical if your vet suggests vaccinating your dog for DHLPP every year. Due to concerns that over-vaccinating can cause autoimmune problems, many university veterinary programs now recommend vaccinations every three years rather than yearly. 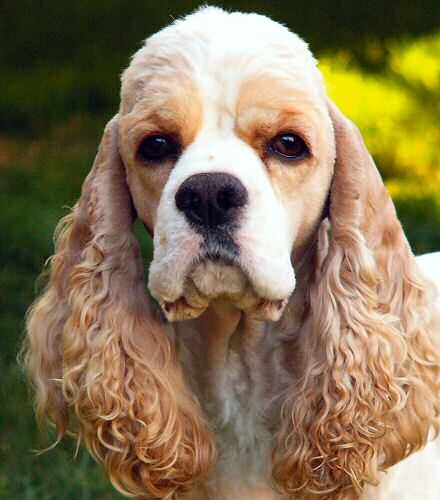 Quite frankly, the Cocker Spaniel is not for everyone. From 1936 through 1952, and again from 1983 through 1990, it was the #1 breed in the USA according to AKC registration statistics. But a lot of people had bad experiences with Cockers, and it's no longer even close to being in the top 10 anymore. 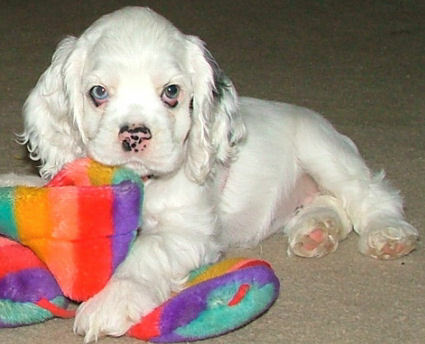 By taking some basic precautions when choosing a breeder, you can increase your chances of getting a healthy and well socialized Cocker. You have to be prepared to do the extra work required to maintain the long coat and to prevent ear infections. You also have to make the dog a part of your family, and allow him to be with people for most of the day. If you're willing to do all of those things, you'll quite likely have a great time with Cocker Spaniels. But if get a Cocker thinking that all you have to do is provide food & water, you probably won't have a very good experience with this breed. 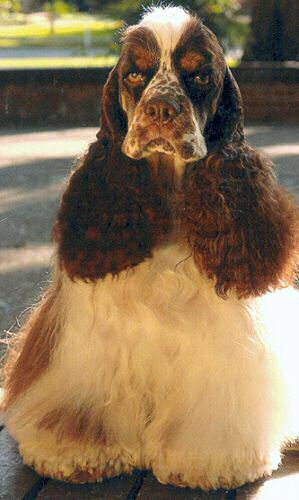 This is the classic look everyone thinks of when they think of a Cocker Spaniel. It's one of the most common and easiest-to-find colors. A much lighter shade than the normal buff. It's almost white, but not quite. 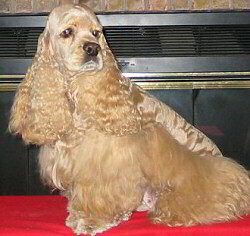 The second most common Cocker color, behind buff. A small amount of white on the neck or chest is OK, per the breed standard. 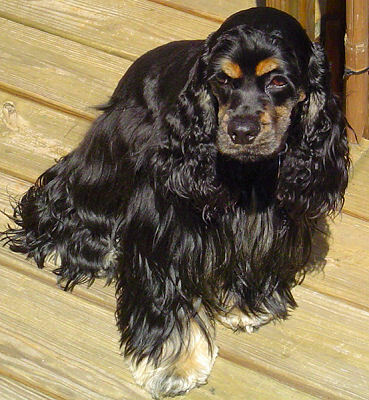 Simply a solid black Cocker with tan points. Probably my favorite Cocker coat color, yet I've never owned one! Simply a chocolate Cocker with tan points. The breed standard says that the tan points shouldn't cover more than 10% of the dog's body. One of the most beautiful Cocker varieties, in my opinion. If the shade of red is very faint, some breeders call it buff & white. A very interesting (and controversial) coat color. I could probably make a whole page of photos of sables that all have different markings. Black fur mixed in with other non-white colors is one tip-off that you might be looking at a sable. Similar to a chocolate & white parti, but with black coloring mixed in with the brown. Similar to a red & white parti, but with much deeper coloring thanks to the sable gene. Every red sable parti I've seen has been absolutely gorgeous. the coat will look like it has a blue tint to it. Roans are very unusual and hard to come by. but with the addition of tan points. 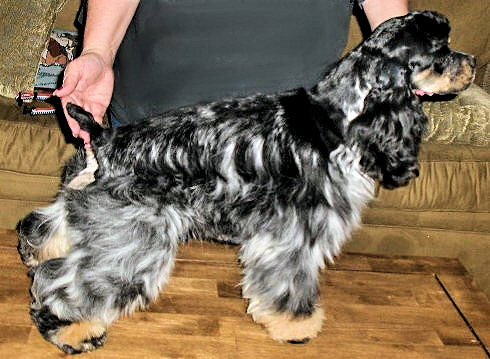 This is simply a solid black Cocker with the merle gene. the coat can look like it has a blue tint to it. Merles are usually registered as roans, and look very similar. 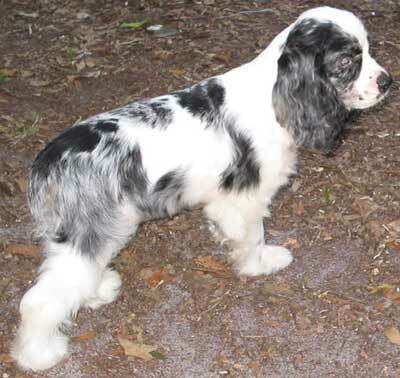 before ever breeding a Cocker with the merle coat. the black fur to gray and how it looks to have a blue tint. So unusual that chances are you'll never see one of these in your lifetime! Small black dots among the white fur, reminiscent of a Dalmatian. It's called ticking because it looks like the dog is covered with the infamous insect. in the photo below. It's the same dog in the right side of the photo above. 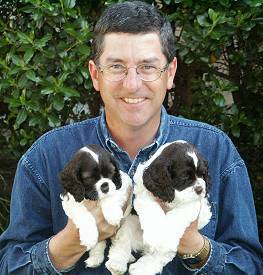 At four days old, there is no signs of ticking on the second puppy from the right. The ticking slowly started to show at about six weeks... most noticeable when the back was shaved. Merle, parti, tan points, and ticking, too. What's especially unusual is that there is both black ticking and tan ticking. and the white must cover at least 10% of the body. 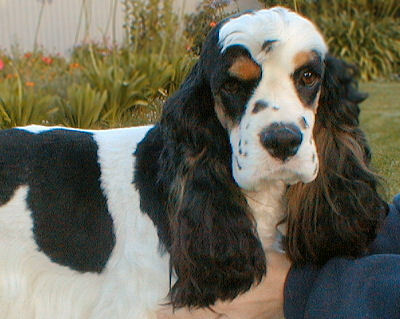 the dog is said to have "open" markings. 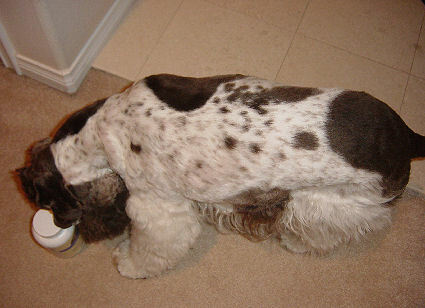 A parti colored dog where the ratio of white to the other color is low. 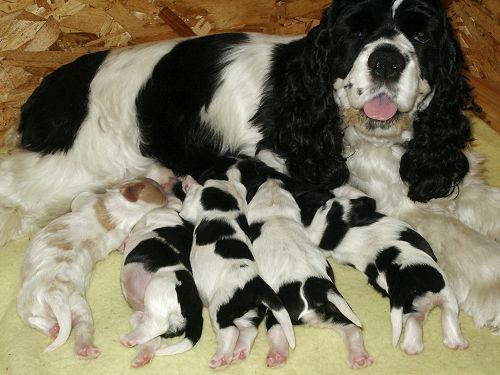 Another term used to described a dog like this is to say that she is "heavily marked". But remember, if less than 10% of the coat is white, the dog is not considered a parti. This is what happens when a parti is bred to a solid. See the white markings on the snout, neck, and feet? That's a no-no... according to the breed standard. Another example of a mis-marked buff, the result of a parti-to-solid breeding, can be found here. People have asked if there is such a thing as a solid white Cocker. Here is is a mis-marked parti that comes pretty close. Genetically, this is a black & white parti, but there is almost no black actually showing. She has a small black area on one ear, and two freckles on her back. That's it. but they are really just a very light shade of buff, not truly white like this gal is. Unfortunately, whatever genetic fluke did this to her coat color also made her deaf. I know all you experienced Cocker people are thinking she's a double-merle... but she is not. blue eyes and deafness, it's not the only way. 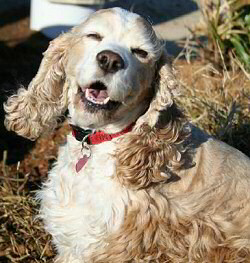 This dog has no merle ancestors whatsoever.